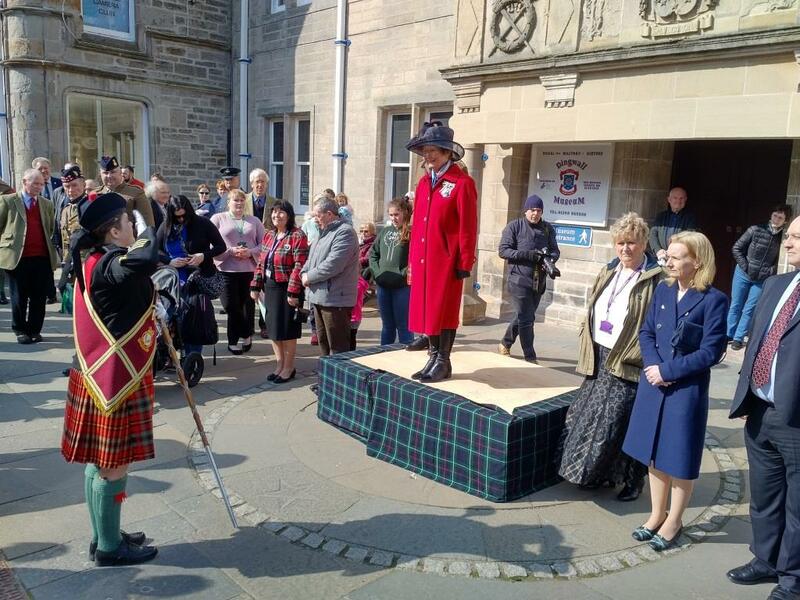 Drum Major Jodie Standen asking Lord Lieutenant Mrs Janet Bowen permission to march the Tri Service Cadet Pipes & Drums off parade outside Dingwall Town Hall. More photos on Flickr at this link. This is the thirteenth year that the ‘Beat the Retreat’ event has taken place in Dingwall since the Cadets first stepped out in April 2006. The event is firmly marked in the Dingwall events calendar and the Cadets from the Army Cadets Force, Air Training Corps and Sea Cadets Corps received a warm welcome from locals and visitors alike. Cadets come from all over the UK every year for tuition at Cameron Barracks, in Inverness. During this time they enhance their playing skills and aim to take part in a number of events including the Dingwall Beat the Retreat and performing in concert at the Ironworks, Inverness to showcase their talents as youth performers. The Cadets formed up at the Army Cadet Centre on Ferry Road and marched along Dingwall High Street where they then massed outside the Town Hall and entertained the crowds with a retreat programme. The salute was taken by the Lord Lieutenant, Mrs Janet Bowen with Colonel Malcolm MacBean in attendance. Also accompanying the Lord Lieutenant were Civic Leader of Ross and Cromarty Area, Cllr Margaret Paterson; Highland Council Convener Cllr Bill Lobban; Cllrs Biz Campbell, Alister Mackinnon and Angela MacLean and Highland Council Chief Executive Donna Manson and Honorary Freeman of Ross and Cromarty Hamish Menzies. (left to right) Cllr Biz Campbell, Chief Executive Donna Manson, Cllr Bill Lobban, Cllr Alister Mackinnon and Cllr Angela MacLean watching the march past.